In 2009, New York passed its Breastfeeding Mothers' Bill of Rights, affirming mothers' rights to breastfeed any place, public or private. The focus of many provisions was on increasing mothers' access to information. Subsequently, hospitals had to share breastfeeding rates and other statistics. The DOH regulation requiring hospitals to disclose breastfeeding rates among their maternity patients also influenced management within hospitals. Maternity unit managers used the breastfeeding data required by the regulation to train clinical staff, set performance goals, and monitor outcomes. The regulation has also encouraged frequent collection and use of breastfeeding data for quality improvement. A perinatal clinical nurse specialist in one New York hospital told us that she generates daily reports on breastfeeding rates in her unit and has been able to document a steady increase in the rate of breastfeeding among mothers in the unit. Data have also helped maternity unit managers advocate more effectively within their hospitals for changes in clinical policies. Repeated reviews of compliance with DOH’s model breastfeeding policy and periodic data reporting have maintained a prominent place for breastfeeding promotion on the agenda of maternity care units and hospital management. Policies must be reviewed for compliance. Data must be disclosed to patients. These requirements continuously demand the attention of administrators, unit managers, and staff. Our findings suggest that transparency policies can significantly influence government regulators and hospital administrators independently of their effects on patients. DOH officials and maternity unit managers appear to have used the pressure and information generated by New York State’s breastfeeding transparency laws to reform hospital policies and practices proactively, not merely in response to signals from patients. Lytton and coauthors Barbara Dennison, Trang Nguyen, and Janine Jurkowski suggest that the study may have implications beyond just breastfeeding policy, providing an example of the ways that disclosure rules may have a downstream impact on actual services. Is it really so bad that WTO ruled against U.S. in country-of-origin labeling dispute? The World Trade Organization (WTO) today ruled in favor of Canada and Mexico, saying that U.S. country-of-origin labeling (COOL) rules violate our commitments in previous trade agreements. The COOL rules in dispute required new labels on fresh beef, pork, and lamb, but not on processed foods such as hot dogs. The labels would say what country the product comes from. In some cases, the labels might have to be complex ("this cow was born in Canada, fed in the United States ..."). The WTO’s continued assault against commonsense food labels is just another example of how corporate-controlled trade policy undermines the basic protections that U.S. consumers deserve. But let me ask, is the WTO ruling really so bad? I have two reasons for asking this question. First, perhaps the WTO ruling has some merit. Canada and Mexico claimed that the U.S. law was designed as a trade barrier, not merely as a consumer labeling provision. They pointed out that the tracking and record-keeping burdens fell more heavily on Canadian and Mexican producers than they did on seemingly similar U.S. producers. They also cast doubt on the consumer information merit of all this tracking and record-keeping, because so much of the meat was destined for processed food that never would carry a country-of-origin label anyway. If the U.S. asks Canada and Mexico to incur tracking and record-keeping costs, and then fails to share the resulting information with processed meat consumers anyway, it does look like maybe the whole point was just to create a burden for our trading partners. It would be one thing if the United States simply never negotiated a trade agreement in the first place. But, it is another thing altogether if the United States does negotiate a trade agreement, saying we will reduce trade barriers in return for Canada and Mexico doing the same, but then we fail to do what we promised. Second, from the perspective of Food & Water Watch and other trade-skeptical consumer groups, perhaps the consequences are not so terrible. This is not true. The WTO cannot order our government to deny U.S. consumers such information. The WTO cannot rewrite U.S. laws. The U.S. can simply refuse to comply. When the WTO rules against the United States, the only remedy the WTO has is the power to permit Canada and Mexico to put up trade barriers of their own, without these trade barriers being ruled non-compliant with the same trade agreements. In other words, the only power the WTO has is the power to state for the record, "fair is fair." For example, if the U.S. chooses not to honor the WTO ruling, Canada has proposed a list of U.S. exports that may get new import tariffs at the Canadian border: corn, meat, apples, pasta, orange juice, and so forth. The United States may honor its trade agreements, or we may fail to honor them. If we don't honor them, surely it is right to be good sports when Canada and Mexico establish new import tariffs. On what grounds should Food & Water Watch or Public Citizen's Global Trade Watch complain about the WTO ruling? If it is fine for the United States to exercise our sovereignty, it is fine for others also. Far from griping about the WTO ruling, trade-skeptical public interest organizations could just tip their hat to the WTO, contemplate the consequences for reduced food trade, and declare, "all is well." There is a good reason why they don't do so. Many Americans, especially in agricultural regions of the country, are glad for the business that trade brings in the form of increased export markets for our farmers. When we remember that Americans are food producers as well as consumers, the trade agreements begin to seem more sensible and the WTO begins to seem more reasonable. 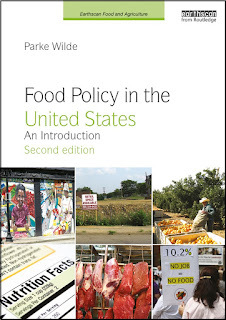 Chapter 4 of Food Policy in the United States: An Introduction addresses trade issues. I do my best to make the case for a public-interest pro-trade perspective in a talk at Cornell University last fall (video here). Frontline last night had an excellent report, the Trouble with Antibiotics, on the plausible link between dangerous antibiotic resistant diseases and the overuse of antibiotics in U.S. meat production. Poultry and hog producers use large amounts of antibiotics even in healthy animals, as a growth promoter and to prevent disease. As bacteria evolve to become resistant to these antibiotics, we lose important tools for treating deadly diseases in humans, including Methicillin-resistant Staphylococcus aureus (MRSA). For readers who want to inspect the scientific evidence for themselves, here are some links to research mentioned in the Frontline report. Jessica Rinsky, Lance Price (interviewed in the report), and colleagues found livestock-associated MRSA in workers from industrial livestock operations but not workers from antibiotic-free livestock operations. Andrew Waters, Lance Price, and colleagues found that MRSA bacteria reaches meat on supermarket shelves. Joan Casey, Brian Schwartz, and colleagues found in the Journal of the American Medical Association (JAMA) that antibiotic-resistant bacteria cases in humans were geographically associated with the proximity of nearby meat producers in Pennsylvania. The Frontline interviewer did a great job questioning the scientists and explaining both the strengths and limits of this type of geographic association. Concerned about the Frontline story, the federal government's National Pork Board has been scrambling to persuade people not to worry about this issue. Reuters reports today that the NPB is funding an online public information campaign to defend antibiotic use. The most damning part of the Reuters report alleges that the NPB is using search engine optimization (SEO) tools so that web users seeking information about antibiotics are directed to industry-friendly web sources. Both Reuters and the Frontline report describe the pork board as an "industry" association, but the National Pork Board is a semi-public checkoff program. The U.S. Congress created this board, the Secretary of Agriculture appoints its members from a slate of candidates suggested by the industry, and the federal government uses its powers of taxation to collect the "mandatory assessment" -- a tax -- that funds this public information campaign. This is not a voluntary industry association. All pork board messages must be approved by the federal government as its own "government speech," so our government is complicit in this public information campaign to rebut the Frontline report. The industry representatives interviewed in the Frontline report didn't really dispute any of the facts, but they engaged in a rhetorical game of shifting the burden of proof. They argued that no further regulation is needed, because there is not yet certain proof that some of the research associations represent true cause and effect. Since nothing is ever certain in this type of research, the industry representatives can feel safe that no level of evidence would ever clear their hurdle. One of the best passages in the Frontline report was an interview with FDA Commissioner Margaret Hamburg. The interviewer asked why FDA does not collect information about the quantity of antibiotics administered by meat producers. Though Hamburg squirmed under the question, she essentially confirmed that FDA wanted this information but could not get it because of industry opposition. In other words, the industry representatives say no action should be taken until we have certain proof, while simultaneously hindering access to the data needed to investigate the question. The industry is pursuing some voluntary steps to reduce antibiotic use for the purpose of "growth promotion," but it has defined this term narrowly so that most antibiotic use even in healthy animals will still continue. The Frontline report is strongly recommended. Now is the time for stronger measures to restrain the overuse of antibiotics in U.S. meat production. Web search interest in "food policy" and "agricultural economics"
Circa 2005, U.S. web search interest in the terms "food policy" and "agricultural economics" was about equal. Nowadays, web search interest in "food policy" is much higher. There may be lessons in this for U.S. agricultural and applied economists. The USDA this week announced a new grant program that will help participants in the Supplemental Nutrition Assistance Program (SNAP) afford fruits and vegetables. The Food Insecurity Nutrition Incentive (FINI) program will offer $31.5 million in competitive grants to organizations from across the food system. These organizations will be able to use FINI funding to support projects that increase SNAP participant access to fruits and vegetables through incentive programs at the point of sale. The Sprout article provides a history and overview of the new program, and it notes divergent views on implementation questions, such as whether the focus should be on farmers' markets or whether it should encompass larger-scale retail channels as well.